This rad risograph celebrates the joy of friendship and diversity. The scene: a middle school classroom, circa 1980. Amid the acid wash and gum snapping, something's in the air—a totally rad sense of diversity. 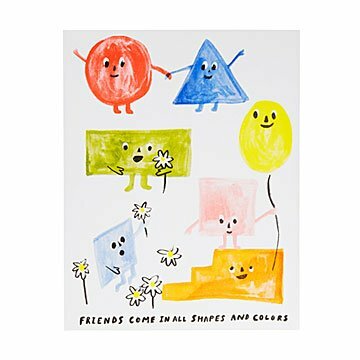 Christine Schmidt's colorful print celebrates the spirit of the Rainbow Coalition and classic classroom decor with a friendly assembly of smiling shapes. Christine explains that the print's method itself hails from the 80s: "If a screenprint and a mimeograph had a baby, it would be a risograph." Colors are printed one at a time in layers of vivid but translucent ink, making each print unique. The playful print makes an inspiring gift for kids' rooms, favorite teachers, or any spot that could use a progressive pop of color. Made in San Francisco, California. I would definitely buy this again and again. I purchased this for a friend/classmate of mine. There are four of us that get together throughout the year. Our friendship has been going on for 60+ years. This birthday gift was so popular that I ended up buying four of them. We are having all our friends sign their names on it making a colorful autograph book to display.